Card Exchange Ultimate truly lives up to its name. Users acquire the Ultimate card printing experience.This Software gives you access to unlimited database server connections, push and pull data from database to database, use the powerful native connections for large databases. But also access to all available contactless encoding functionality including MIFARE Classic and DESFire functionality, including DESFire EV1 support. Card Exchange Ultimate offers users a broad spectrum of exciting tools. Users are able to utilize signature capturing, User logins, and the new powerful database drop down boxes. The Ultimate edition is the only Card Exchange software that allows for creation of your own customization and lets users embed it into Card Exchange. By means of writing some simple code you are able to manipulate your data. Just a simple text editor is enough to create your own coding. 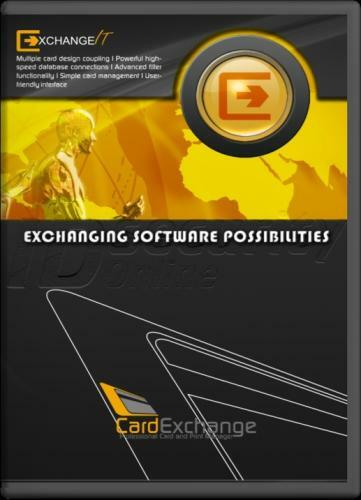 Card Exchange contains a powerful compiler that compiles your code in seconds and make the functionality available inside of Card Exchange. Ultimate also supports the standard Twain image acquiring, and can be extended with the Photo Exchange add-on to provide more extensive camera support. This add on allows users to access any Direct Show camera from inside their Card Exchange program. Photo Exchange enables users to see the subject they want to capture in real time making for steady and Ultimate looking photographs. If you�re still unsure as to whether or not Card Exchange Ultimate is the right option for you, download a free trial directly from our website! This 42 day trial allows users to experience the full benefits of Card Exchange Ultimate without any risks. At the end of the trial, you can purchase the software or simply try another version until you find the right Card Exchange program for you.